A review of the new Tapeo Restaurant that just opened in January 2015 in Hazlet NJ, inside the Holiday Inn. It's a Spanish / Portuguese place, featuring specialties from both cuisines with a refreshing upscale look, part restaurant, part tapas bar. 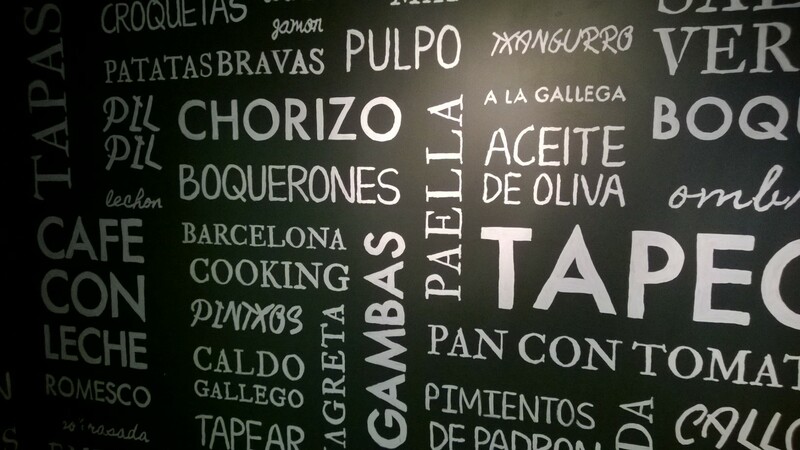 Tapeo is a new restaurant that just opened in January 2015 in Hazlet NJ. It’s inside the Holiday Inn on Hwy 35, and it’s a nice surprise to find such a nice restaurant in a roadside hotel! It looks nothing like the usual hotel fare, it’s a standalone place with its own setting and character. The promos might make you think it’s just a Portuguese restaurant, but it’s actually an Iberian combo – Spanish / Portuguese, featuring specialties from both cuisines. I really liked it on the first visit. It has a refreshing upscale look, part restaurant, part tapas bar. It is a bit pricey, but I think it’s totally worth it as the food was pretty good. There’s the usual drinks mix – wines, cocktails, sangria, beers (I took the “local” Euro flavor – Estrella Galicia). We skipped straight to the entree, but you’ll find on the menu appetizers like Croquetas Cremosas, Chorizo, Calameres or Boquerones, both as a full appetizer and the smaller tapas version. In our group I pulled the winning ticket, since I got what I think was the best entree: Parrillada Portuguesa Mixta, a mix of skewered grilled pork, beef, chicken and chorizo with chimichuri sauce. There was a lot of meat (6 skewers with one piece of each; the chorizo was outstanding, pork was extremely tender, chicken and beef were not bad either. Other people in our group had (and I tasted) Arroz con Pollo (herb roasted chicken with saffron rice) which was OK, I think it’s more of a Cuban influence, and the seared Salmon – fish was very good with great spices, but very small portion, almost nothing besides it. 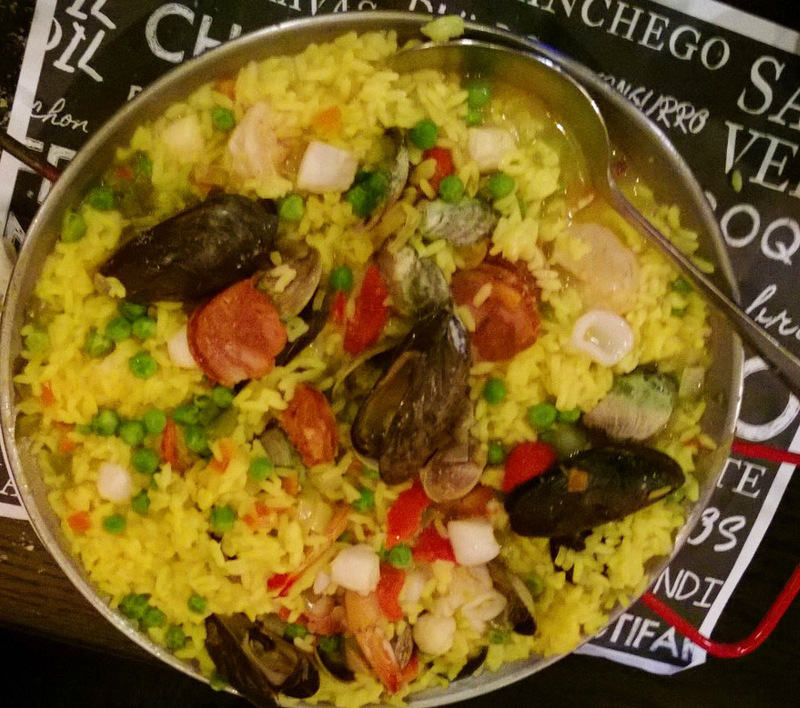 We also had the Paella de Mariscos which I didn’t try since I don’t eat shellfish, but it got good reviews. I have to add that the homemade potato chips they bring to the table are excellent, big slices, and soft without losing their shape. There was also a nice live performer while we had dinner, Wayne D Hughley, who sang oldie and R&B songs in a variety of voices, from Elvis to Louis Armstrong to Pharrell Williams. The volume was just perfect so you could still have a conversation at the table. The only critique I’d have is that service was extremely slow (we spent almost 2 hours there while having just entrees, no appetizers or desert), and they forgot what we ordered a few times, but they can be excused since the place had just opened a few days before and they’re still working out the kinks.